Rockland Melbourne carry on review | Excellent value bag! Carry on luggage does not need to be expensive. Sure, a bag from Briggs & Riley will outperform anything on the market and will definitely be better made. But if you are on a budget there are some really great options out there. These include the Transcend Magna 2 and the MaxLite 4 from TravelPro. If even these bags are a bit out of your price range, we think we have found a really good alternative. This is our Rockland Melbourne carry on review. Find out if this bag can check all of your boxes and become your next purchase. The Rockland Melbourne carry on bag is not the best bag in the world. But it is definitely a contender for the best bag for the least cost. And its user base swears by its durable ABS exterior. Let’s get this out of the way right away. This bag is NOT in the same quality category as most Tumi, Briggs & Riley and Eagle Creek bags. We wanted to include a review on it because it hits such a great price point that these other companies simply can’t touch. So in terms of reviewing this bag, we will be taking it from the perspective of how much it actually costs for those features. The ABS outer shell on this bag provides pretty great protection from bumps and scratches but is also really light at just 7.3 pounds. And this outer shell is available in a whopping 31 different designs and colors. This personalization is one reason why this bag is currently the number one selling carry on bag on Amazon. People who have purchased this bag really swear by its durability. The four spinner wheels are very smooth on airport floors but are a little small for our taste. We can imagine these wheels wearing down fairly quickly and needing a replacement in a few years (obviously depending on how you use the bag). The aluminum telescopic is also pretty well-made. Offering a push button handle and fairly “wiggle-free” stability, we are surprised at how high quality the handle is for the money. The Rockland Melbourne carry on is a standard 22″x9.25″x22″ dimension bag. This means that it should be no problem for most US domestic airlines. You would have to check with your international airline on this size however, because it is on the upper end of most airlines. Want something a little more full-featured? Check out the Briggs & Riley Baseline Domestic or the Tumi Alpha 2. The inside of the bag is a clamshell design that splits the inside half and half. One side includes a zipped compartment perfect for a suiter bag or large packing cube. The other side is a more open main compartment. This side includes compression straps and a zipped pocket for accessories. Sure, nothing groundbreaking to be seen here but it is certainly a serviceable design that will get the job done. The value of this bag really lies in its insanely low price point. The materials are good, but not top notch and users have reported that Rockland’s warranty is very hit or miss (mostly miss). So if you buy this bag, go in knowing that you are a bit on your own in terms of repairs and replacements. But at this price you should be very happy with a 2-5 years out of this bag. 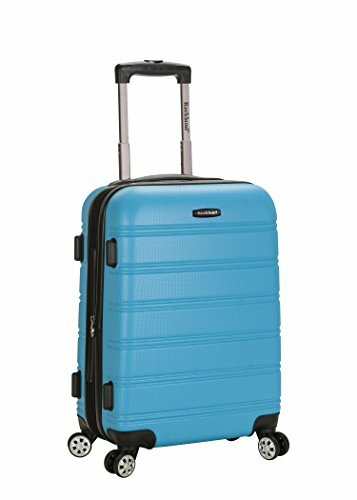 Rockland Melbourne carry on review round-up: Should I buy this bag? If you’re in the market for a new carry on bag but don’t want to kill the bank account, this bag is a great option. It won’t win any gold awards for design or materials, but over 1,700 positive Amazon reviews don’t lie. You’re getting a solid bare-bones carry on bag with the Rockland Melbourne carry on.